Lori is a brilliant mind. Not only is she our VP of education and can answer almost any weird babywearing question I’ve thrown at her (Is there such thing as a quarter buckle? Can I nurse from a back carry? Do all pods have fringe? ), but she is a certifiable EXPERT when it comes to the SSCs. I am hardly an expert almost inept in comparison, so when Lori got excited about a new carrier… I HAD TO have her write something up about it! Shhhh… grab your notebooks. This is going to be good! 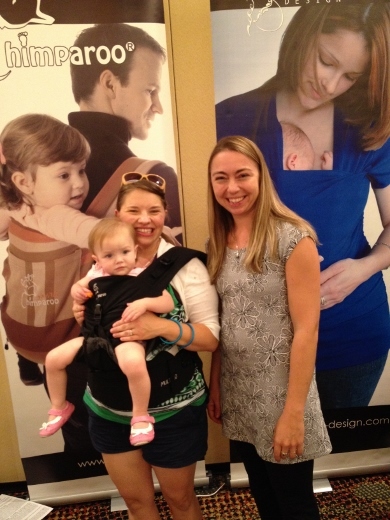 Hanging out with Chimparoo in the Vendor Hall at the International Babywearing Conference 2014! 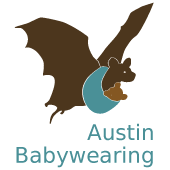 One of my favorite parts of the International Babywearing Conference 2014 was getting to talk to the manufacturers and try out all the new products! I will be writing up a summary of all the new soft structured carriers (SSCs) I had the chance to check out while there. This post, however, will focus on one particular SSC I super geeked out over. On my first day there the Heathers from our chapter leadership told me to be sure to go check out the new Chimparoo SSC. I love the Chimparoo products in our lending library so first chance I got I headed down to the vendor hall to see what they were talking about. I was excited to see Christine Duhaime, the founder of Chimparoo, in their booth! I actually spent a lot of time over the next couple of days at IBC 2014 chatting with her about their products. What I appreciated most was all of the thought put into each feature of their products. It was clear just how passionate Chimparoo is about babywearing and Kangaroo care. This post is about their new SSC to hit the market so I will stick to that, but I want to thank her for hooking us up with a great deal on a new (desperately needed) ring sling for our lending library. I also want to suggest that if you are currently pregnant, have a newborn or work in a NICU, you check out their fantastic shirts designed for kangaroo care! If I was going to have another baby I would totally buy one for myself! Look at that seat!! Even kicking, leg-straightening and wiggling to see all the excitement around her, as my toddler does, that seat is awesome! The new Chimparoo soft structured carrier is the Multi 2.0 and it is seriously cool and I totally understand why the Heathers sent me over to check it out! This carrier allows for forward facing in, forward facing out, hip and back carries. It boasts some of my personal favorite SSC basics like crossable straps, dual-adjust waist clip and light-weight, breathable fabric. At first it looks a bit intimidating, but once I started putting it on it was clear both the caregiver and child’s comfort were kept in mind and using it was a snap (literally!). The carrier was in the forward facing out position when I walked up so I started by trying that out. Now, my daughter is no longer a baby and is most definitely a long-limbed toddler, so forward facing out is not my first choice for her. 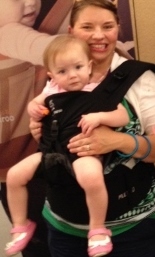 As you can see from the picture to the side, this carrier made forward facing a breeze and even with her toddler legs it kept her in an AWESOME deep seated position! No oddly dangling toddler legs here! I was surprised how light she felt in the outward facing position. The way this carrier is designed, baby is snug against you and even leaning a bit into you, which I think helps with the feeling of the wearer’s center of gravity being thrown off. This meant that I did not feel the pressure of her weight on my shoulders or lower back as much as I normally do in the forward facing out position. Emma bean, being the curious little lady she is, also enjoyed facing out quite a bit! She was less than enthusiastic when I switched her around to face in so I could try out that position (as can be seen by her crabby face in the picture below). Facing in was comfortable as well and had some neat features too. To switch it from forward facing out to forward facing in, you just unclip one clip and zipper the front panel down on both sides. You can snap the seat closed, though you do not have to. She also added a safety buckle near the zippers on each side as an additional safety if you know you are going to be wearing for a long time in the forward facing in position (for, say, a five mile hike in Texas hill country). 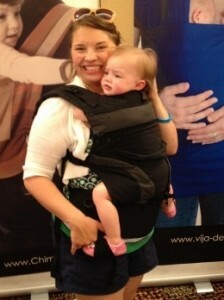 What is extra cool about Multi 2.0 carrier is that it is designed to grow with your child. Emma is a tiny for her age and still a bit small for them, but I put her in the cool toddler features so you could see them. Look how much height is added to the carrier with the zippered back extension open! First is the stirrups. These clip to clips on the waist band of the carrier and help keep your toddler’s legs in that ideal “M” position that we all like to see and not just dangling. I personally thought my wiggle worm would kick her feet right out of them, but nope, she obviously agrees these are a comfortable feature as well! My favorite feature, and one I think is brilliant in its simplicity, is the zipper along the top of the body panel to, again, help the carrier grow with your child. Emma probably does not need this just yet, but I wanted you to see it in action. This back extension zippers closed to shorten the body panel for the forward facing out option and a smaller baby but unzips to reveal an additional two or three inches of body panel length for a toddler. How cool is that?!? I LOVE it! The Multi 2.0’s smart design means it can easily be used from birth into toddlerhood. In addition to the things I talked about above for my tiny toddler, it also has some great features for newborns and smaller babies. Instead of a completely separate piece for the newborn infant insert, this carrier has a stretchy fabric panel on the inside of the carrier that creates a seat for small babies. This fabric just tucks away into a pocket when baby out grows it and you don’t have to worry about losing it between kids. The minds behind this carrier were also thinking about our newborns when they designed the sleeping hood. Made of stretchy material, it can be spread wide for a sleeping hood, or bunched down to create additional head support for baby. I cannot tell you how many times I have had parents worry out loud about head support for their baby in SSCs, this is an awesome solution! This really is a carrier that will grow with baby! I want to thank Christine again for taking the time to chat with me about the Multi 2.0 and all of the cool stuff Chimparoo has going on! It was so neat to talk to the mind behind the work. 2 Comments for : What the Who is a Chimparoo?